While conducting my annual Freeing of the Rosebushes last Saturday (also the annual Burning of Jess' Pale Flesh and Reminder to Use Sunscreen), I reached my hand into a crack between two landscaping bricks in order to pull out some crabgrass and the crabgrass slithered! I screamed! Then felt quite foolish as I realized that the slithering was not an anaconda (could happen) or giant hairy tarantula (look, I'm a wee bit arachnaphobic), but something small. I pursued and called Griff over. Bricks were moved, small scaly creature was grabbed, Griff and I were tickled to see this tiny little lizard. It was surprisingly strong and tried to bite me but failed to draw blood due to the fact that a) I was wearing rubber-dipped mud gloves and b) it has a very small and fairly toothless mouth. Griff ran inside for a bug house and we popped the wee beastie inside. Googling later that day suggested that my captive was a female broadhead skink. I figured we should give her a name, and Griff, who has never shown much interest in naming things, rejected my suggestion, Lexie, and declared that her name was simply "Skink". Skink the skink. Ok. Who needs an individualized appellation when you can just be what you are. Anyway, we kept Skink around so that we could introduce her to our younger party guests on Sunday. We offered her two bugs - one a small beetle that Griffin found, one a smaller beetle that hitched a ride into the house on Adam. The smaller one either escaped or was eaten. 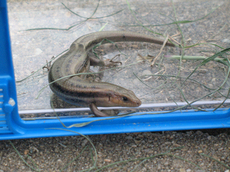 Lexie...er, Skink...didn't seem unhappy in her plastic domicile, but I figured it was time to let her go today. I took two short videos to document the occasion. Maybe we'll come across Skink in the backyard again some day. It seems likely that I'll neglect the roses enough to give her a nice weedy home, at any rate.